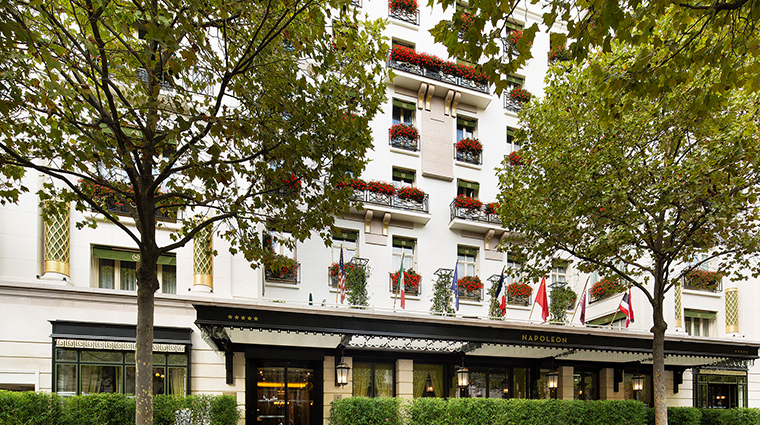 Among the 20 districts within Paris, the Eighth Arrondissement is where famous French ruler Napoleon Bonaparte is most remembered, and where Hotel Napoleon Paris is located. His tribunal Arc de Triomphe attracts droves of visitors who shop along the Champs-Élysées and is a short walk from the tucked-away hotel. 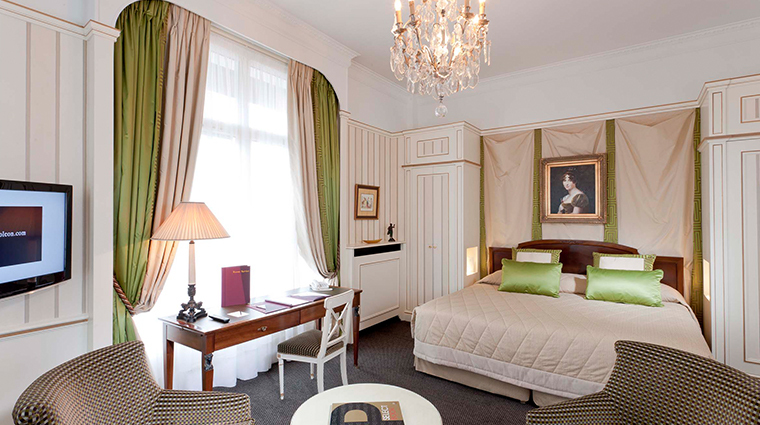 Hotel Napoleon has a charming story behind it as well. 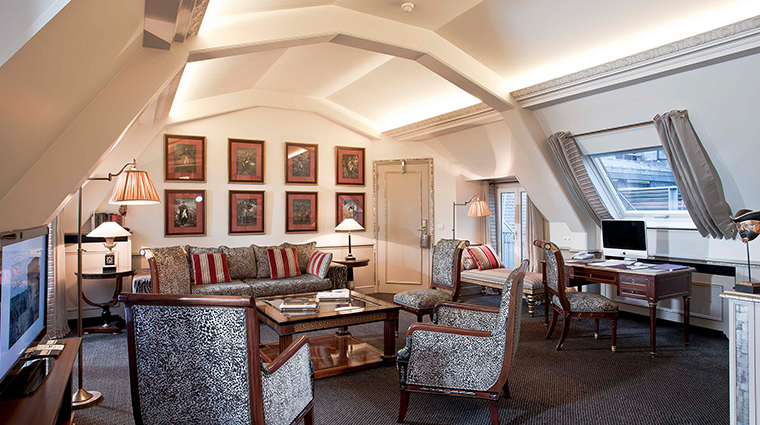 A wealthy Russian traveler, Alexander Pavlovich Kliaguine, presented the place in 1928 to his bride, a young French woman he met and fell in love with while at a literary salon — her portrait is a warm welcome to hotel guests upon arrival. 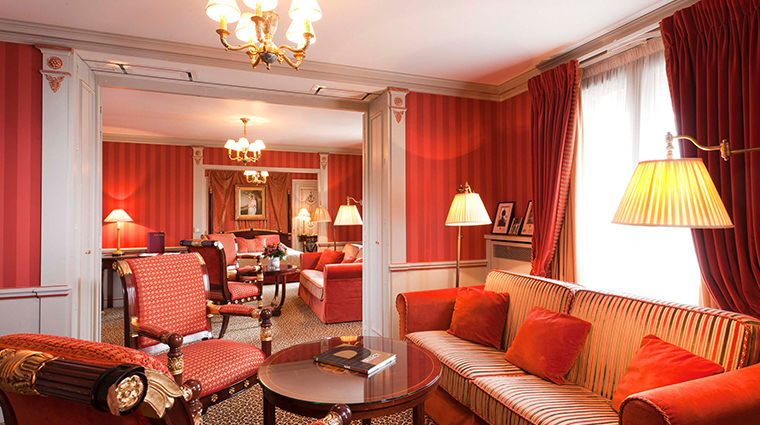 After a few days in the elegant property, you too will fall head over heels — only this time it’ll be because of beautiful wingback chairs and exquisite meals. 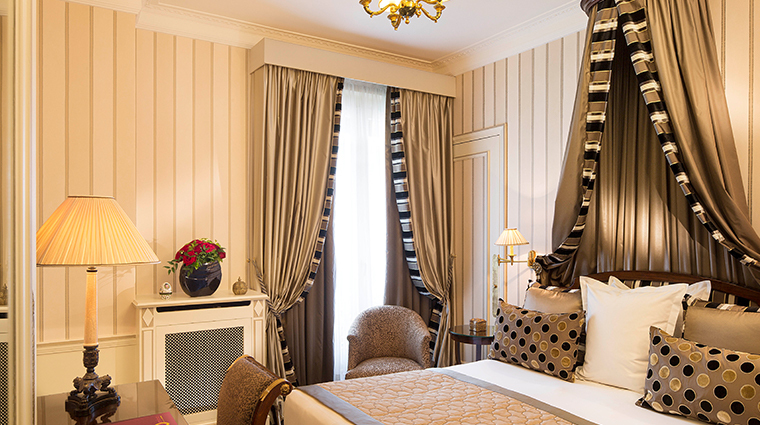 The classical décor is unique within each room and the feel is meant to emulate that of a stay in a private mansion. 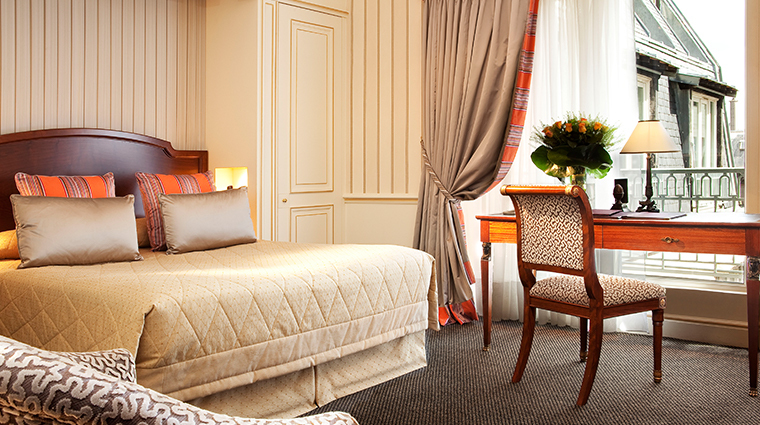 The hallway walls are decorated in multi-colored striped velvet with interior soundproofing material. 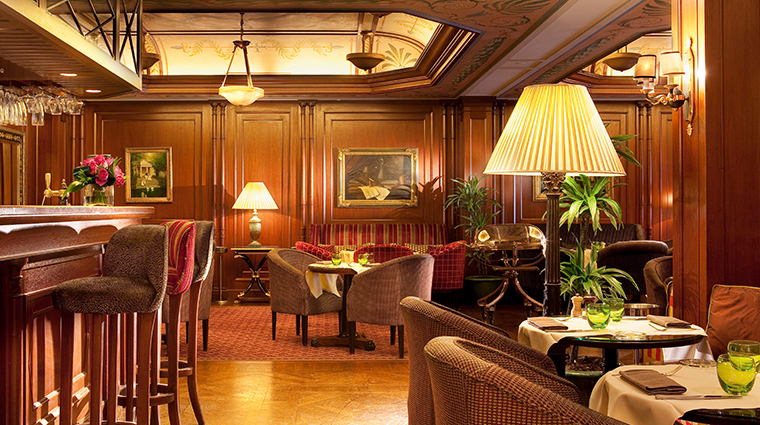 Though the area is brimming with eateries begging to be explored, the hotel’s Le Bivouac is a charming spot for a meal with a clubby feel, painted dome ceiling and warm woodwork. 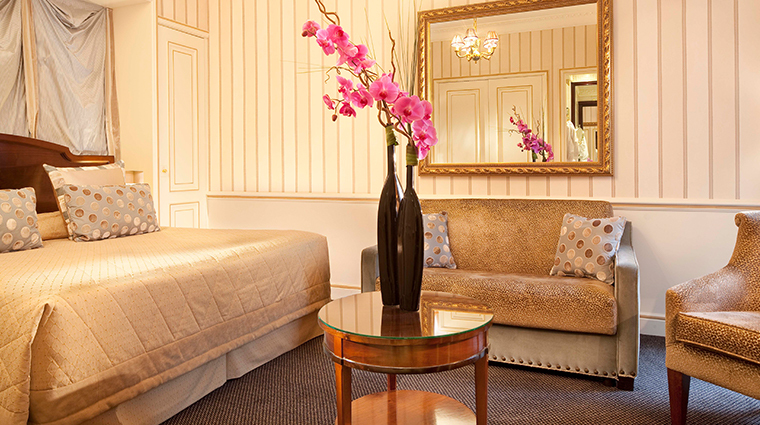 While there is no spa, massages may be arranged in a private room next to the cozy fitness area on the top floor. People-watching is best performed while seated at the terrace outside the entrance. References to the hotel's namesake can be found everywhere. A copy of the Louvre’s famous Coronation of Napoléon painting hangs over the fireplace. 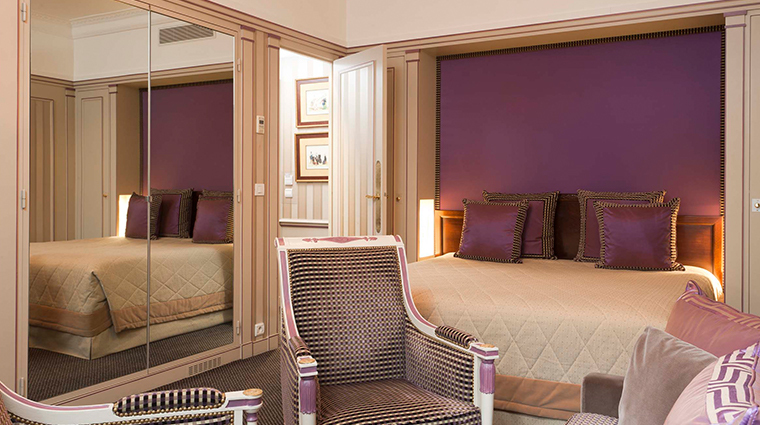 A nearby hallway is adorned with several quirky portraits of Napoleon’s canines, each dressed in full military uniform. There’s also a framed family tree that shows the extensive connections in Napoleon’s bloodline. 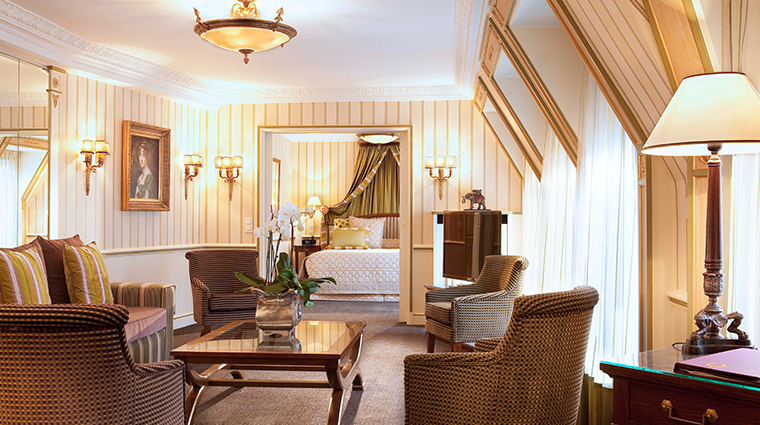 Errol Flynn, Ernest Hemingway, Salvador Dali, Miles Davis and Ella Fitzgerald were frequent guests of the Paris hotel. 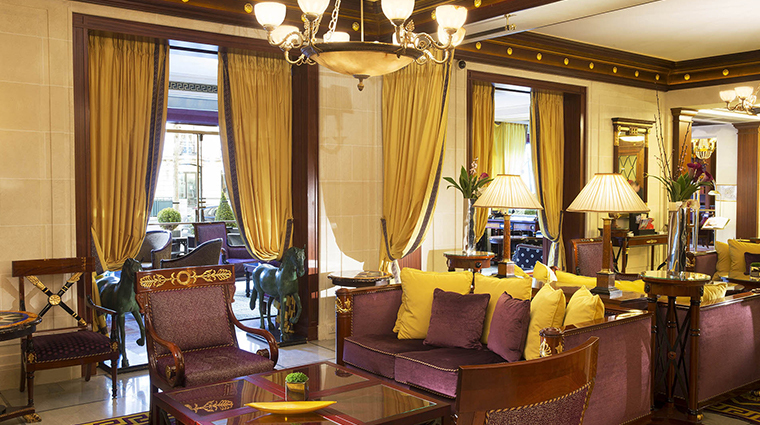 Expect rich tapestries and lines, gold accessories and pops of bold colors in the rooms. 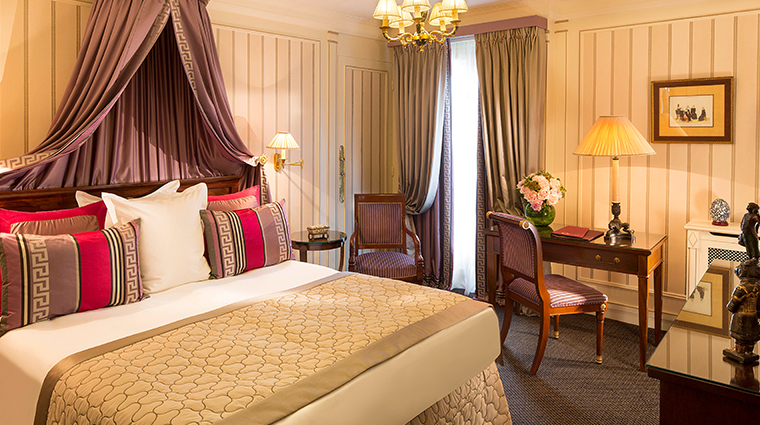 All of the beds are crowned with majestic canopies known in Paris as ciel de lit. Marble sinks and floors add glamour to the spacious bathrooms. While the L’Occitane toiletries add a refreshing, verbena-scented freshness to your day. 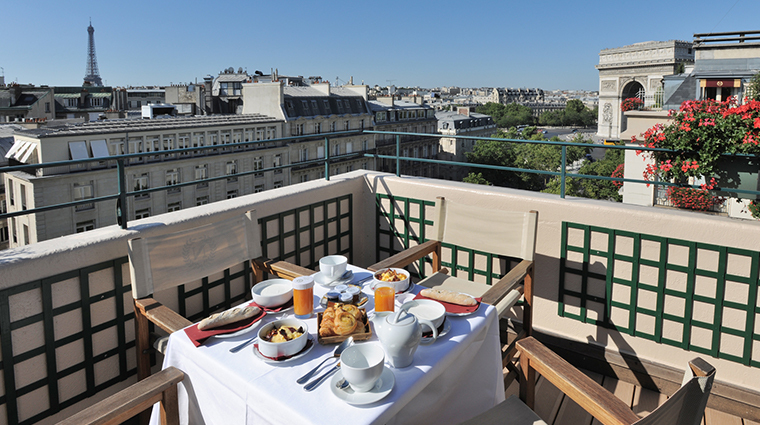 Four junior and regular suites offer terraces with street views, but the top floor is the prime spot to see the Arc de Triomphe, Sacré Coeur and the sparkling Eiffel Tower. Le Bivouac serves French-influenced breakfast, lunch and lounge bites. 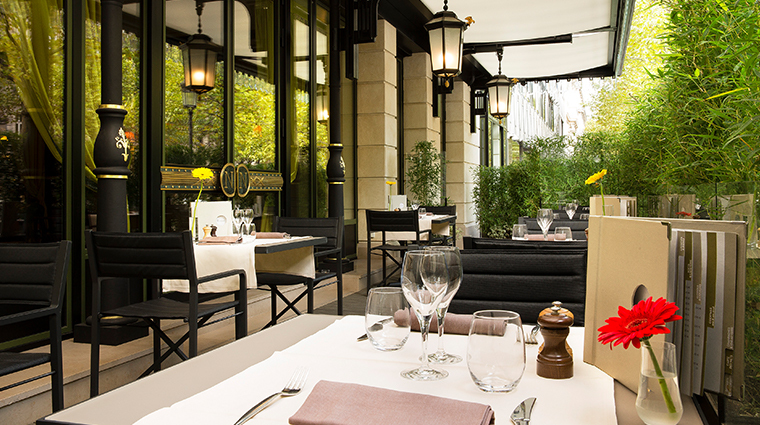 There’s also an outdoor terrace where you can view Parisian street life while sipping a cocktail or tea. After you’ve conquered the city, take a load off at the bar with a Champs-Élysées (cognac, green chartreuse, lemon juice, sugar, aromatic bitte) or Le Basilic (basil, strawberries, lime, vodka and champagne). On Thursday evenings, there’s even live music.